The Shenzhen Investment Promotion Agency is a full-time government agency that attracts investment from the Shenzhen Municipal Government. Committed to the introduction of enterprise projects and talent teams in line with Shenzhen's urban positioning and industrial policies to help domestic and foreign companies to grow and develop. In order to expand investment channels and innovate investment methods, Shenzhen Investment Promotion Bureau also believes that new media communication channels should be used in a timely manner to establish a new media public platform. organization. Promote the immediate release of institutional information, increase investment channels, expand investment scope, and establish a convenient and open platform for overseas investors to help overseas companies grow and develop. The move also responded to the "Internet +" action plan proposed by Premier Li Keqiang, actively building the "Belt and Road" and strengthening interconnection between countries along the route. After understanding customer needs, Weishang Interactive recommends providing customers with new media platform project development and new media generation services. Information transmission and exposure through various channels can not only help netizens to obtain important policy information of the promotion department more quickly, but also improve the “floor rate” of major decision-making deployment and policy documents, and bring these institutions closer to ordinary people. It has also expanded its investment channels, innovative investment promotion model, and established an open platform for convenience stores for overseas investors. It has become the best bridge between promotional agencies and overseas companies, creating numerous opportunities for the in-depth development and development of overseas companies. 1. Analysis background: Analyze the nature of the industry and organization in which the service object is located, and understand the relevant learning knowledge. 2. Clarify the need: clarify the most direct needs based on officially released information and understand the content of the service. 3. Develop a plan: Develop a reasonable and reasonable operation and promotion plan based on the background and needs analysis. 4. Build a platform: According to the plan, gradually improve the platform construction of time nodes. 5. Release content: Full-time writers post relevant push information on each platform. 6. Planning activities: Professional planners plan activities based on the actual situation of the organization and arrangement. 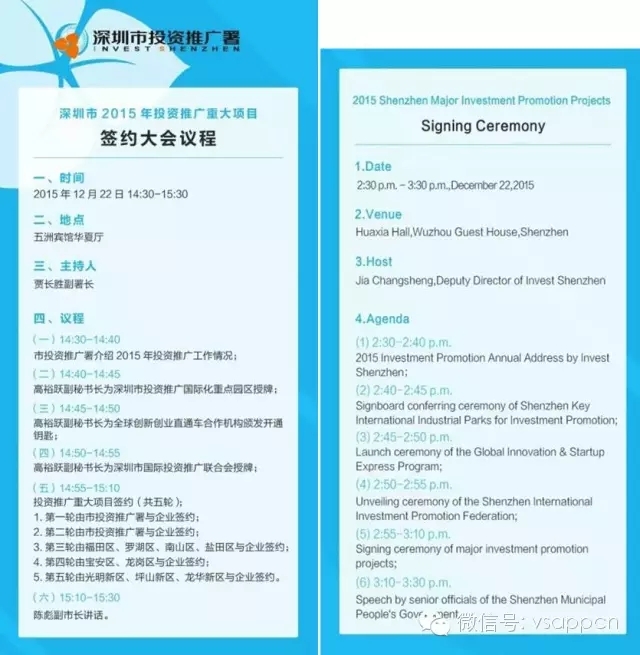 On December 22, 2015, the Shenzhen 2015 Investment Promotion Major Project Signing Conference was successfully held in the Huaxia Hall of Zhangzhou Hotel. 44 projects from key industries such as finance, life health, and the Internet announced that they have settled in 16 key industries in Shenzhen. The park was awarded the Shenzhen Investment Promotion and Internationalization Park, and the seven global innovation and entrepreneurial express trains “debuted”. The Shenzhen International Investment Promotion Association was also announced at the meeting. 3. Activity summary analysis stage: statistical analysis of activity data, do a good job of data reporting, and lay a good foundation for the follow-up activities to better carry out.